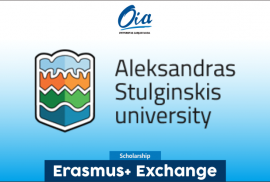 Application for exchange in Aleksandras Stulginskis University is now open for UGM Students! ASEAN and the other three partnership country particularly Japan, Republic of South Korea and China. This activity is conducted as part of the ASEAN+3 Leadership and Cultural Summit which will be held in Universitas Airlangga as the host university of this programme. cooperation among students and scholars in a particular way that encourages friendship both for the local delegates and delegates come from outside Indonesia as well as the ASEAN community. The main theme of this event is “Sustainable development in digital era on ASEAN+3 Region”. The forum will be started in the second day of the summit where the delegates will be divided into several groups after the first presentation session is over. This group will be divided based on the subtopic that they have been chosen in writing their papers. Subsequently, the forum would conclude with a joint statement which contain various recommendations on key issues affecting the region. National Central University (NCU) was re-established in Taiwan in 1962 as part of the country´s response to the International Geophysical Year. The school was initially located in Miaoli, but was relocated to Jhongli in 1968, and gradually developed into a comprehensive university. 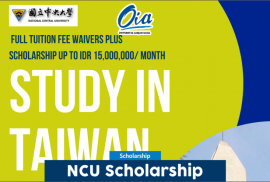 NCU has now become Taiwan´s leading school in the fields of geophysics and space science, and was selected as one of the major research-oriented universities in 2001. It is a first-rate university with solid international qualifications. National Central University (NCU) held an open recruitment for all the students who have an interest to continue their master or doctoral degree in NCU. The applications are allowed coming from any university in Indonesia in November 6th -9th. 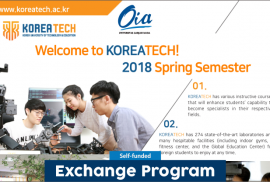 KOREATECH sends about 200 students a year overseas through various programs such as exchange student, language program and global project, and overseas internship. By attracting foreign students (undergraduate, graduate, exchange student, language program student), KOREATECH fosters global leaders with an international mindset. Sophia University has more than 200 partner institutions worldwide and receives exchange students based on the student exchange agreements. Every year, more than 300 exchange students study at Sophia. 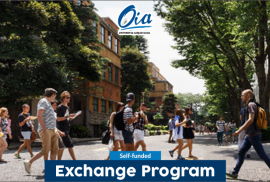 Participating exchange students pay tuition to their home institution for the period of their stay at Sophia. Exchange students will be responsible for their own room and board and transportation to and from the host institution. Viet Nam National University Ho Chi Minh City and Can Tho University, in collaboration with AUN Student Affairs Network Secretariat (Universiti Utara Malaysia), and the ASEAN University Network (AUN) Secretariat, will organize the 6thASEAN Student Leaders Forum (ASLF) with the theme: “Commitments and Actions toward the Prosperous ASEAN community.” and the 2nd AUN-SAN Meeting in Ho Chi Minh City and Can Tho City, Vietnam on 05-09 December 2017. 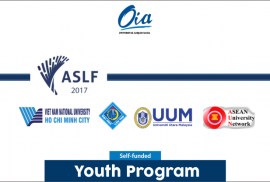 It is our honour to seek your kind cooperation to nominate at most 3 student leaders from your university’s Student Government body (or its equivalence) and to nominate 1 Vice President of Student Affairs (or its equivalence) to participate in the 6th ASLF and the 2nd AUN-SAN Meeting on 05-09 December 2017 in Ho Chi Minh City and Can Tho City, Vietnam. “ASEA-UNINET STUDENTS WEEK” is an academic mobility program, designed to facilitate graduate students from ASEA-UNINET universities’ member to participate on a short program with a duration of 2 weeks (December 3—16, 2017) and earned 3 credits (with 44 contact hours) upon completion. 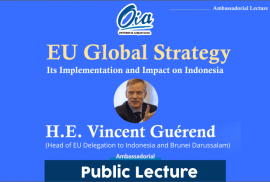 This program is specifically designed so that the participants not only benefit academically through in class lectures (with multi-disciplinary field of study approach) but also get the opportunity to have an internship or field study and given the exposure of Indonesia culture through the cultural engagement included in the program. “Sustainable Development”, chosen as the theme of this year program, aims to encourage participants to have broadened intellectual and awareness on the importance of sustainability, which has been a global issue, and challenge faced by modern society. 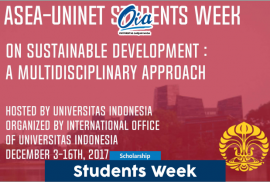 Universitas Indonesia invites every ASEA-UNINET member university to send 2 (two) graduate students as the representatives from each University to join this program. The program fee is 380 USD/person including airport transfer on departure and arrival, meals during the program (exclude dinner), program materials, certificate of participation and cultural activities during the program.